giveaway :: homemade living :: !! When I grow up I want to be a full time homesteader and raise chickens, make my own mozzarella and enter my tomatoes into some kind of state fair. I dream of gardening, canning and baking my way through the day and then settling down in the evening curled up next to my husband and dogs. Basically I want the life of Ashley English. Ashley is the author behind the Small Measure Blog and her series of books Homemade Living. I became smitten with Ashley when I was gifted her first book, Canning & Preserving. There has always been a part of me that yearned to know more about becoming more homesteader-esque; I like to call them my grandma-isms. It started with learning how to garden, then preserving jam, a failed attempt at knitting and with the help of Ashley I’m moving on to keeping chickens, rescuing bees and making cheese. 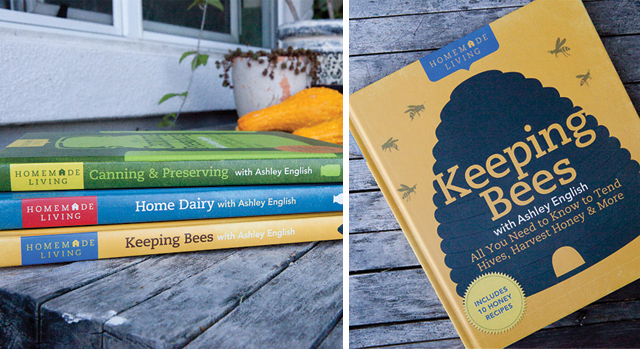 Lucky for you Ashley and her wonderful publisher, Lark were kind enough to send me a copy of Keeping Bees and Home Dairy to give away to my wonderful readers. Post a comment below before August 18 and you could win her books! I can relate to your blog today. I am 57 years old and have never learned canning, I have my own little garden which is presently growing tomatoes, peas, squash and I think a pumpkin. My garden is very ecological and it includes native plants and I replaced the lawn with a native grass called dymondia (not sure of the spelling). I pulled up all the carpets in my house and added cork flooring but I still never did any canning. I have a few friends and we get together once or twice a month for cooking classes. Last week one of our friends taught us how to can jelly. I could not believe how easy it was. I am now really thinking more and more about canning. Great blog, thanks for sharing. wow! you’ve done some really cool things. I’ve always liked cork floors! So glad you learned how to make jelly – it really is amazing how simple it is. Have fun!! As a young married woman I lived in the country. I grew veggies and flowers, I canned, baked my own bread, and cooked up a storm. Life is different for me now, but I still grow veggies and flowers in my Hillcrest apartment patio, and take immense delight in my hummingbird and caterpillar/butterfly friends. Remember the saying ‘bloom where you are planted’? As long as I have the connectedness to the earth, I can deal with the rest! I live in an apartment and have attempted to bring a small bit of urban homesteading into my life…on the patio where I was having a potted garden, the squirrels in the area loved the tender green shoots so much that they would eat them as they began. They are tenacious, scaling the 3 foot wall of my patio with aplomb! I’m looking to find a way to garden. That is great! I started my garden in pots too! It’s a great way to get started. I find that herbs do really well on the patio plus it makes it super easy to clip them fresh for your recipes! Those books sound like a great read! I used to help my mom make jam as a kid, but I’m pretty sure I got to stir and had no impact on the actual canning process. However, my husband and I just bought a house in San Diego and are working on adding chickens and raised beds to our vermicompost, local food, and fermenting adventures. Those books look fabulous! Banana Jam!!!!!! hmmmmmm….that sounds a little scary but I will see about it! OMG – I am also impressed with how much you guys do!!! If only the days were 36 hours long and we only had to work for 8 of those hours, sleep 4 and then the rest could used for PROJECTS! If you have not already, you should read Farm City. It is about a woman after your own heart living in the slums (by choice) of Oakland, CA who decides to have a farm in a nearby vacant lot. When I say farm I don’t mean a garden but a great garden as well as a menagerie of farm animals and bees. She actually lives strictly off of her farm for 3 months. It’s a great story. Thanks for the Ashley English info. I had not heard of her. I am anxious to look her up. Missing you in our CSA here in Vegas! HI Laura! Thanks for the reccomendation! I will absolutely check that book out! I’m hoping that very soon I’ll be able to have my own little “great garden”! I am crossing my fingers for this one! I had seen these books at an Edible Magazine event and wanted them so bad. But they where all gone when I tried to get one. I had forgotten just how much I wanted them until now. I am crossing my fingers and my toes on this one. I saw the feature in Edible too! The books are amazing! Good luck! I always watched my mom can and make jam as a child. Nearly two years ago I co-founded a collective housing urban homestead. We’ve hosted group workshops around these topics and wish to amass a lending library on the topics of gardening, homesteading, animal husbandry and natural building. I recently purchased all the Mother Earth News archives from the 1970s to the present for this purpose. I’ll keep my fingers crossed. Wow Ann! You’ve done some amazing work! Where are your group workshops based out of? I have learned that gardening has it’s up and down’s. Sometimes you have a great garden and can’t give enough away and sometimes you stand there wondering what you did wrong and wished all those people you gave everything away too would give it back. The little 6 year old even got the bug. She can never wait to come over and check on my rainbow carrots and sample some, fresh out of the garden and washed off with the hose. Then grabbing a couple of more to share with the dogs. I am trying the teach her not to be afraid of bees because they won’t get her and that they help the garden grow. Growing up I would spend my summers in upstate New York with my Nana. We spent many hours on the family fruit and veggie farm. I picked lots of fruits and veggies and I remember going into the cellar and seeing cans from the 70’s of different jams. I think its an art that could be lost with upcoming generations and I love the fact that you are bring it back.My mom taught me how to can tomatoes and I even learned to make pickled tomato relish, which is something that I would love to share with my son one day. Granted he will probably just eat everything..but still! Great stuff! Bring on homemade parmesan cheese! Yes I am willing to buy a special fridge and wait for a year. Just imagine how amazing a big wheel with a custom Cheve Cheese stamp would be! Chass, I love your books that inspire you which in return result in a good meal for me!!! I also learned to make jam with you, and will forever smile when I see a mason jar filled with jam since it reminds me of you and I in the kitchen together. I love the new blog design! 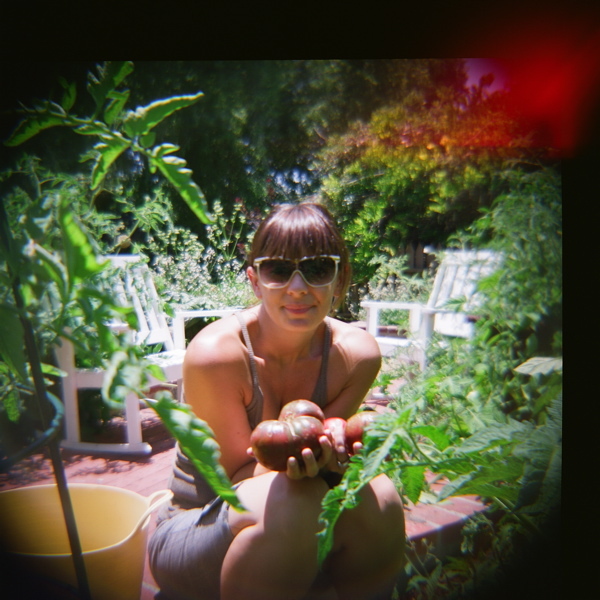 I have always grown up with backyard gardens, so it’s in my blood to grow some of my own food. That’s something I can’t wait to share with my son, and I have big plans to rip up the lawn and install some amazing raised beds with drip irrigation. I am hoping to add bees or chickens at some point as well. I just have to get my husband on board with my dream of being a suburban farmer. I have an organic garden which gives my family fresh and helthy vegetables and herbs. This post is very nice. Thanks for sharing.